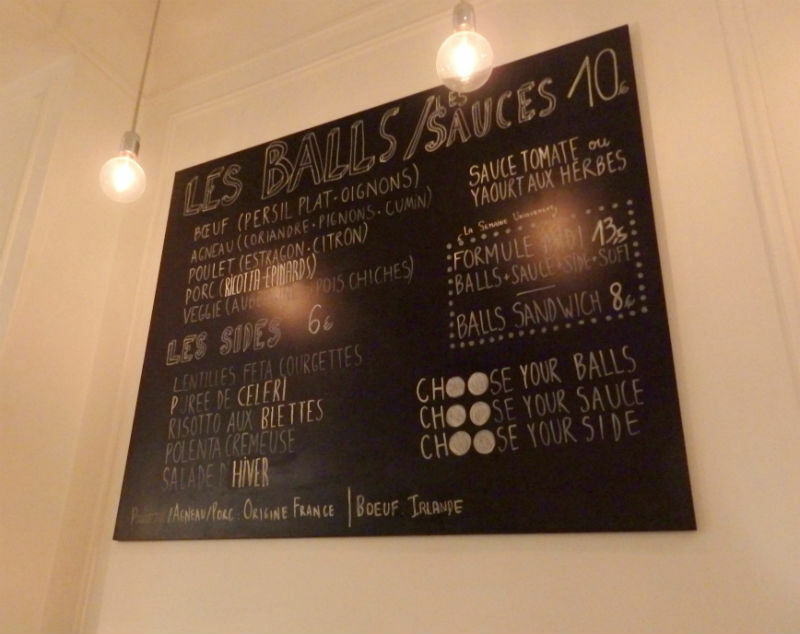 This hip restaurant has only been open for a little over a year but it sure has made a name for itself in Paris…and that name is BALLS! As the name states, it specializes in various types of meatballs (obviously that’s what first came to my mind… ;)) and it is very popular with the trendy Parisian crowd! 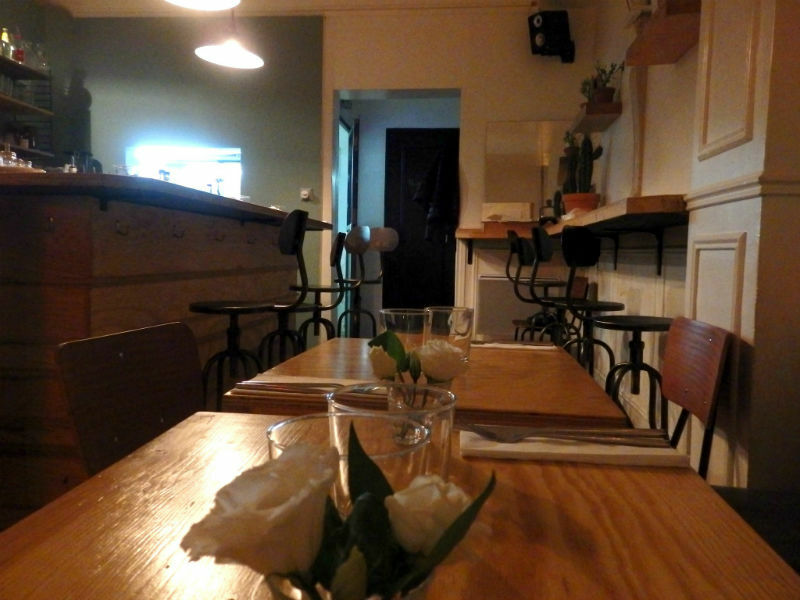 The restaurant itself is very pleasant with light wood tables (adorned with freshly cut white roses) and otherwise minimal decor, giving it a very natural and fresh feel. 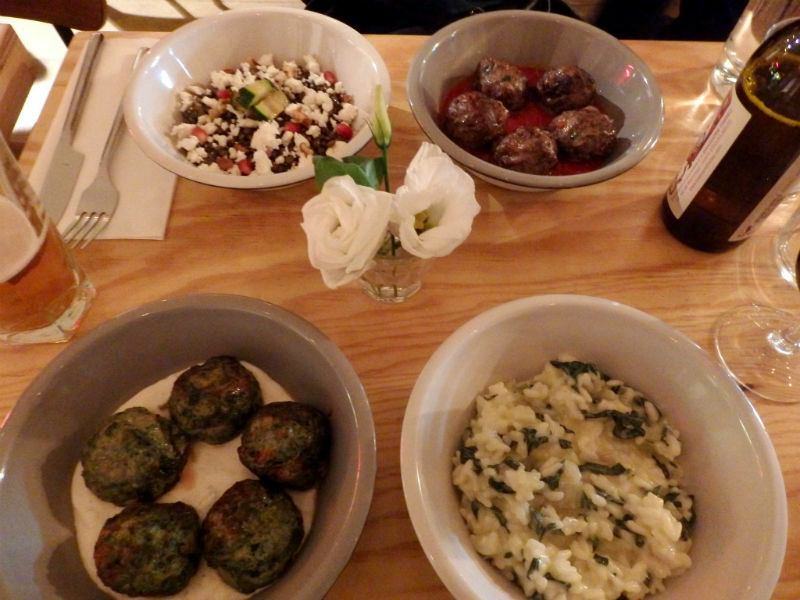 The idea is simple: choose your balls (5 per dish), that come with either a herb and yogurt or tomato sauce (for 10 Euros), and add one of their side dishes (6 Euros) to accompany them. I sat down with my friend K on a Tuesday night and after a few minutes of giggling at the cocktails (9, 50 Euros), named white balls, black balls and Rosemary’s balls (ummm?? 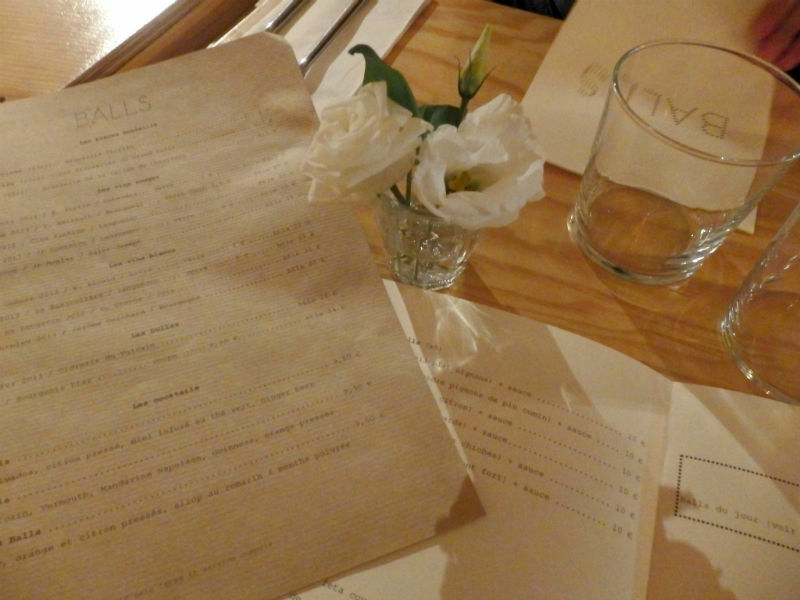 ), we carefully studied the food menu. One of the friendly owners, Jérémie, informed us that they were out of lamb balls and I was a little disappointed, as in my mind I had already chosen them. 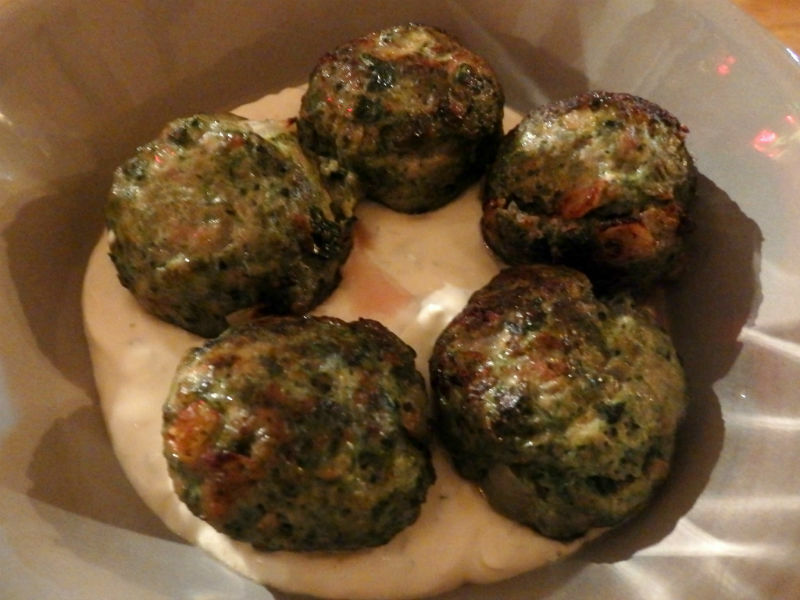 Luckily I found a suitable alternative in the pork, ricotta and spinach balls with their yogurt sauce and a side of creamy chard risotto. K took the beef, parsley and onion balls with tomato sauce and a lentil salad. 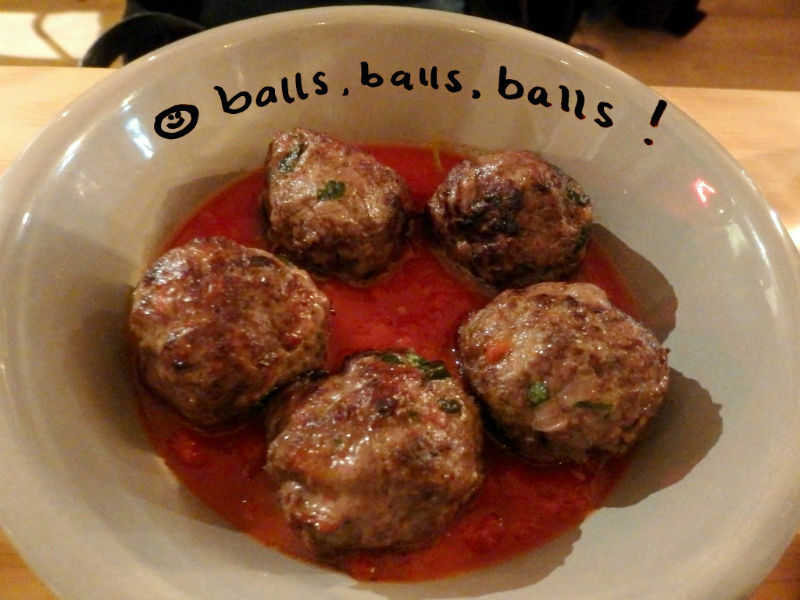 I LOVED the pork balls, which were extra moist and flavorful, and found the beef balls to be very good as well. I won’t describe them in any more detail; otherwise this will sound like a reading from the infamous SNL comedy sketch “Schweddy Balls”! 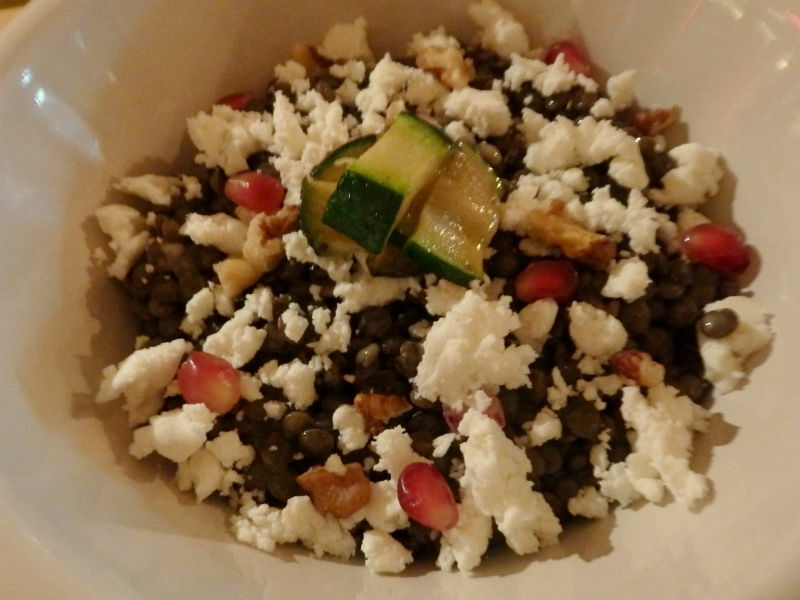 The risotto was delicious and the lentil salad had a great mix of textures with the lentils, feta, grilled zucchinis, pomegranate seeds and walnuts combining harmoniously. A glass of wine (5 Euros) and a beer (6,50 Euros) completed the meal nicely. Just so you know, there are also some veggie balls made from chickpeas and eggplant on the menu for those of you who don’t eat meat! I especially enjoyed the music selection, a mix of chill hip-hop and electro pop. I sat there licking the last bit of yogurt sauce off of my fork while Gorillaz – Meloncholy Hill played cheerfully in the background. 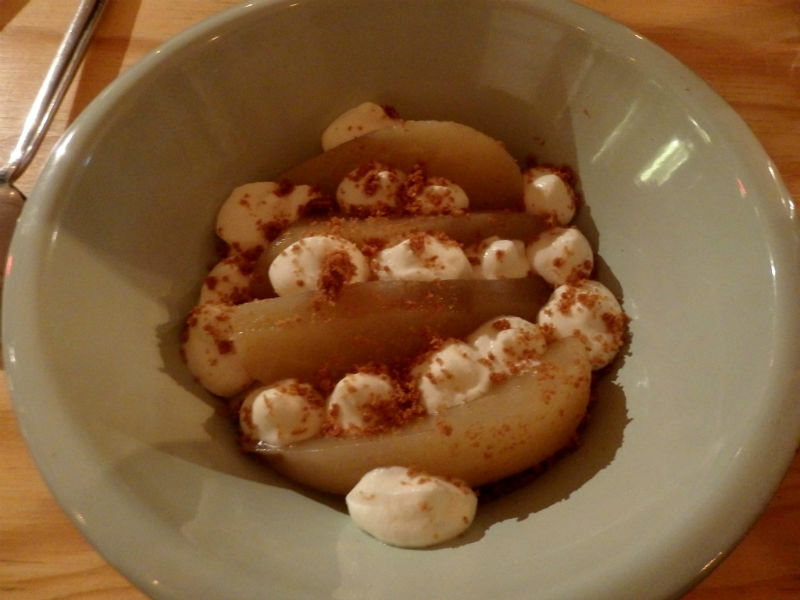 Even though we were pretty full, we decided to share a dessert: poached pears with almond cream and sprinkled with something that looked and tasted like crushed spéculoos cookies (5 Euros). It was light and refreshing and was savored to the song Disclosure – You & Me. At one moment a girl arrived at the table next to us that was occupied by two British guys and one of them blurted out “you’ve arrived just in time, our balls are on the table!” Clearly, I am not the only one who finds the name of this place super amusing! You should know that writing this review without including constant dirty jokes was kind of a challenge for me…but I think I controlled myself pretty well. All jokes aside, the food here is really good and definitely lives up to the hype. You can equally come here for lunch where a portion of balls, a side dish and a soft drink is just 13, 50 Euros, and they even do take-out! So come on down to Rue Saint-Maur and give their balls a try! 5 juicy balls out of 5! 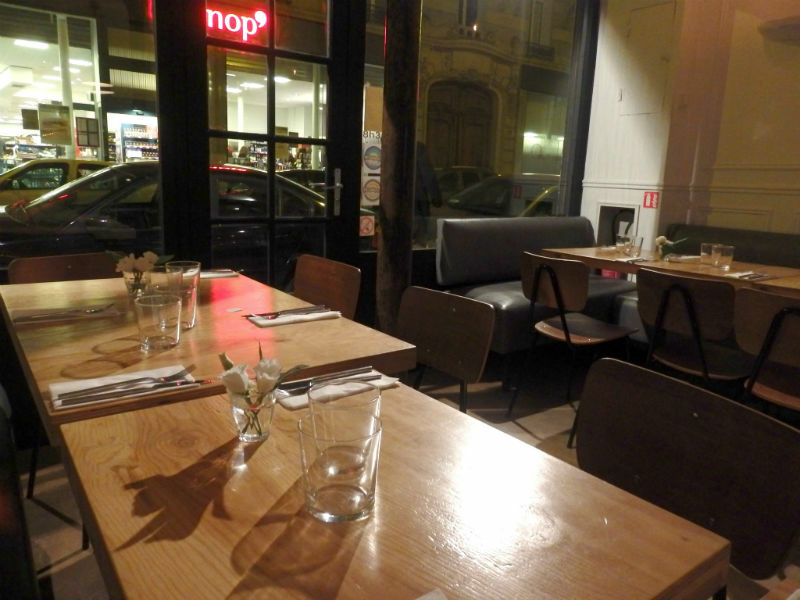 Categories: Uncategorized | Tags: balls, foodies, meatballs, paris restaurants, trendy | Permalink.